Order Your Christmas Ham Today! Formulated With Higher Protein For Turkey and Game Birds, Sunrise Farms Offers Non-GMO Turkey Starter Feed. We understand how the right feed gets your flock off to the right start. Whether you raise turkeys or game birds, our non-GMO turkey starter feed recipe provides increased protein for healthier chicks. 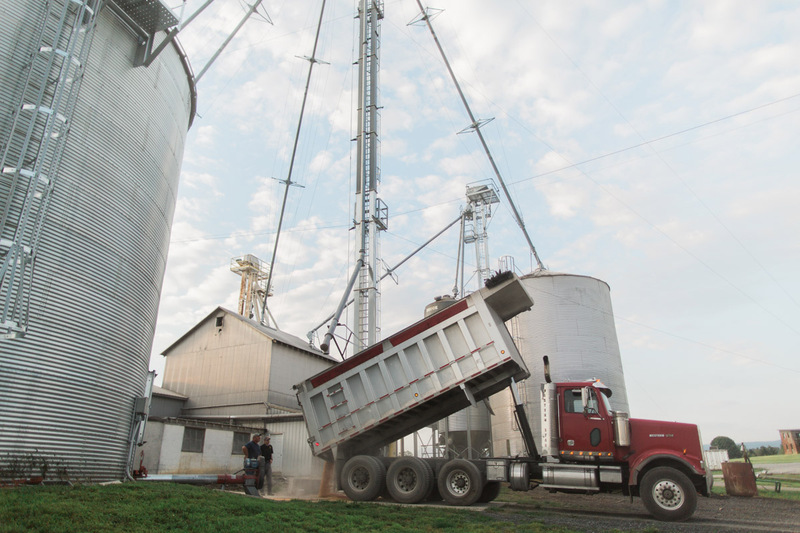 Our on-site mill accommodates custom feed blends to a specific formulation for your flock. Our feeds contain no added hormones, no antibiotics, and no medications. We require a minimum order of 500lbs. or 10 bags with a nominal fee for custom orders. Finely Ground Fresh Feed Sets Your Birds Up For Health. Our family farm grows turkeys, so we know how to help turkeys grow into healthy, all-natural birds. We finely grind our turkey starter feed for easy consumption. Our on-site mill allows us to adjust the coarseness and texture to suit your flock. 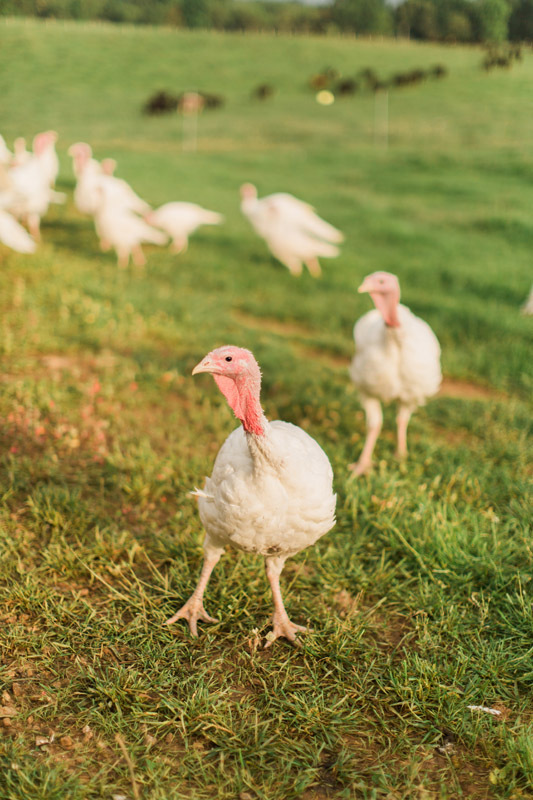 Our turkey starter feed contains no added hormones and no antibiotics, and is made from non-GMO grains from trusted suppliers. We are able to provide quality assurance that our feed is non-GMO because we work with grain growers we know and trust, as well as run our own mill to be sure each and every blend is up to our standards for freshness and quality. Sunrise Farms Non-GMO Turkey Starter Feed Is Available Throughout The Contiguous U.S. 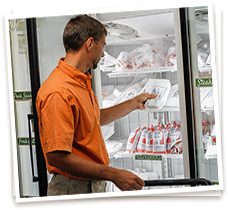 In Virginia, select dealers carry our turkey starter feed. 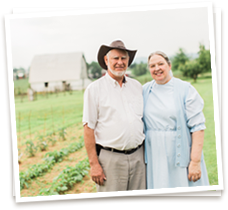 The Sunrise Farms label provides quality assurance that your non-GMO feed is expertly mixed. In the area of Stuarts Draft, make orders directly from our farm storefront, conveniently located just 3.5 miles off I-64 at exit 91. We will prepare your non-GMO feed order in all quantities for you to pick up. Our other purchasing options include regional feed delivery and feed shipping throughout the contiguous United States. Feed is sold in 50lb./22.68kg bags and by the ton. Feed free choice to turkeys for first eight weeks as a complete ration. Provide fresh water, fresh air, and dry bedding. Roasted Soybeans, Corn, Fishmeal, Mono-calcium Phosphate, Organic Dehydrated Kelp Meal, Salt, DL Methionine, Calcium Carbonate, Vitamin A Supplement, Vitamin D3 Supplement, Vitamin E Supplement, Menadione Dimethylpyrimidinol Bisulfite, Riboflavin Supplement, D-Calcium Pantothenic Acid, Niacin Supplement, Choline Chloride, Vitamin B12 Supplement, Folic Acid, Thiamine Mononitrate, Pyridoxine Hydrochloride, Biotin, Manganese Sulfate, Ferrous Sulfate, Zinc Sulfate, Copper Sulfate, Sodium Selenite, Organic Soybean Oil, Dried Aspergillus Oryzae Fermentation Extract, Active Dry Yeast, Dried Lactobacillus Acidophilus Fermentation product, Dried Lactobacillus Casei Fermentation product, Dried Lactobacillus Plantarum Fermentation product, Dried Enterococcus Faecium Fermentation product, Dried Bacillus Lichenformis Fermentation product, Dried Bacillus Subtilis Fermentation Product. Contact Us For Non-GMO Turkey Starter Feed Today. What Is The Sunrise Farms Difference? Great feed selection and wonderful sales associates and mill employees. Great place for feeds, meat, and Non GMO products. Great place to pick up different farm fresh meats. Try some of the family’s favorite recipes! Receive special offers and seasonal recipes right in your inbox.